In late May of 1754 in the far backcountry of Virginia a young colonel of the Virginia Regiment fired the shots that would "set the world on fire" and place three great powers - Great Britain, France and the Native Americans - on a course to determine the control of North America. But this event was not spontaneous; it was the result of a string of events that had begun years earlier. Together, they would propel Europe's two great powers into a conflict in North America that would spread across the globe. On his trip to the Ohio River country in the winter of 1753-54 to deliver a letter demanding the French leave British claimed territory, George Washington made a visit to Logstown, an important Native Amercian town on the Ohio River below the Forks. Here he met the Half-King, Tanaghrisson, and assured him of British friendship and willingness to help oust the French from the Ohio region. He also got a party of Indians to act as guides on the trip. 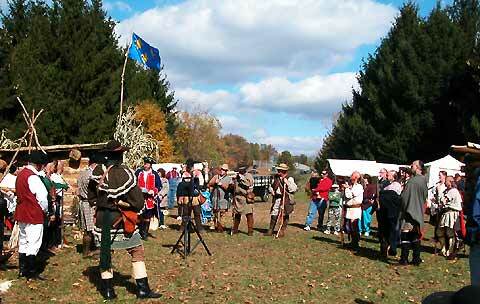 The Beaver County Historical Research and Landmarks Foundation is to be congratulated for putting on a wonderful reenactment on October 18 & 19, 2003 to commemorate this historic event. 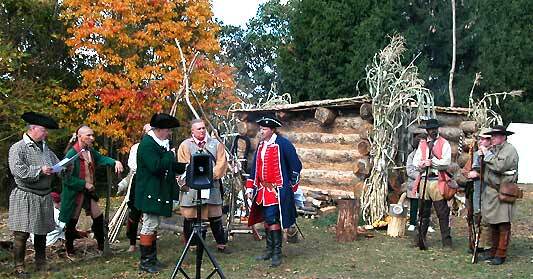 The program included a commemorative reenactment of George Washington's arrival and many demonstrations of frontier and Native American skills. The photographs shown here are from the event which was very educational as well as entertaining. 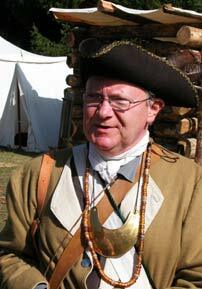 Logstown was established by the French on the Ohio River as a convenient place to trade goods with the Native Americans. It was named "Logstown" because the French built some log cabins. Not long after the French built it, the British traders from Pennsylvania and Virginia began to make inroads into the trade with their superior and cheaper goods. Soon it was a British trade center. A number of Indians settled here including the Half-King, a leader appointed by the Iroquois Confederacy. At Logstown one could find a variety of goods. 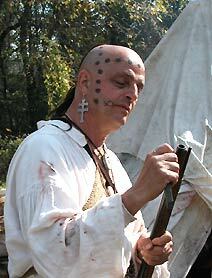 Guns and shot and powder were very important to the Indians. 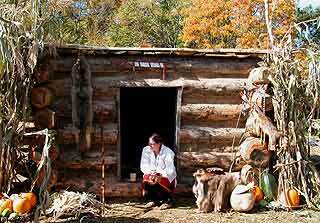 They had become dependent upon the white man for such goods and had given up the use of their primitive skills. 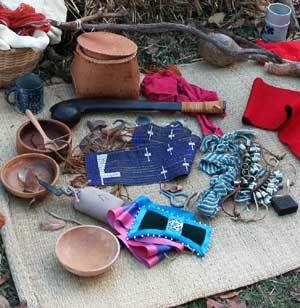 Likewise, the cooking utensils and steel knives of the white man were valued. To buy these items, the Indians traded animal skins that they hunted with guns or traps and also some native crafts that they produced. This trade in skins was very important because in Europe many of the fur bearing animals had become extremely scarce from over hunting. The Europeans still desired clothing made from these skins and were willing to pay high prices for them. 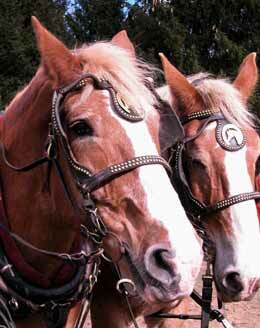 This made the fur trade very lucrative for the British traders. 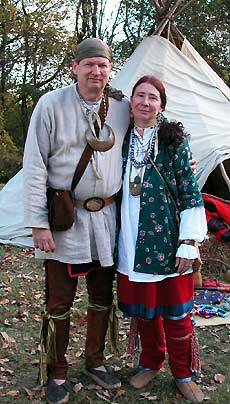 Spectators at the Logstown event were treated to a variety of reenactors portraying people one would find at frontier trading posts. It was not just the ordinary people that one would find. 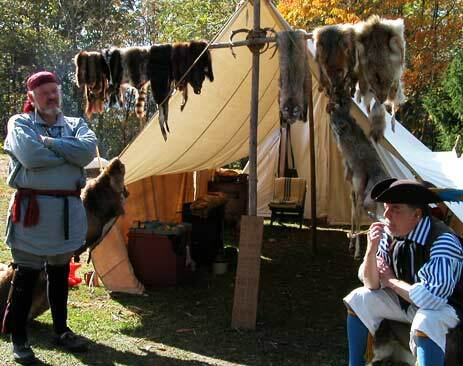 These places and conferences such as Logstown would host Native American leaders and Colonials who would eventually shape the events that brought about the war. Thomas Lee, Thomas Cresap, George Croghan, William Trent, Conrad Wiser and others would work to forward their own fortunes or their company's fortunes (such as the Ohio Company). The Indians would try to persuade the white man to trade but not settle on Indian land. Eventually these opposing interests would lead to armed conflict. Again, the folks in Beaver County are to be thanked for all the hard work and dedication that it takes to put on such an event. We hope that they will continue through the coming years, 2004-2010, to help America commemorate one of our most important conflicts. P.S. A special thanks to "Doc" and "Dan," who stole the show as far as many of the children were concerned - not to mention those folks with weary feet who enjoyed the ride on the wagon.